The Winner’s Guide series of books offer the most comprehensive and accurate discussion of several popular video games ever produced. 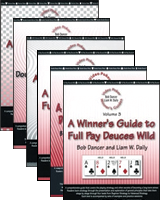 These Guides cover both strategy and non-strategy aspects of play that are important for winning at video poker. They range in size, but average around 100 pages apiece (except for Pick’Em Poker, which is shorter). Readers learn strategy through the presentation and explanation of basic principles that take the reader stage by stage through four strategy levels from beginner to advanced. 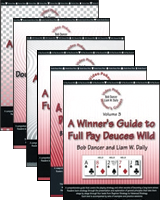 Where appropriate, the Winner’s Guides include appendices listing and explaining the exceptions necessary for complete mastery. As well as the strategies for the full-pay versions of the games, strategies are also presented for the widely available “non-full-pay” versions of the games that have returns (before counting cash back and comps) of approximately 99%. Bob Dancer’s well-publicized million dollar win in six months started with the mastery of the games. 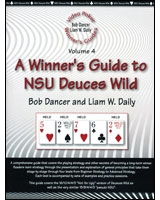 Volume 1: Jacks or Better – Second Edition, including 9/6, 8/6, 9/5, 8/5, 8/5 Bonus and 8/5 with quads paying 35. 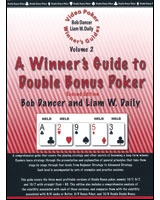 Volume 2: Double Bonus Poker 2nd edition, including 10/7, 9/7, and 10/7 returning 80 for a straight flush. 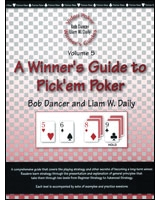 Volume 5: Pick’em Poker. This includes two rather than four strategy levels. 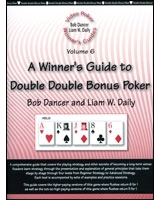 Volume 6: Double Double Bonus Poker, including games where the flush returns 6 and the flush returns 5.